Volkswagen Vento PDF Workshop, Service and Repair manuals, Wiring Diagrams, Parts Catalogue, Fault codes free download!! Volkswagen Vento is a compact class sedan manufactured by Volkswagen Concern from 1992 to 1998 and has replaced the Volkswagen Jetta II model. Since 2011, India has offered the Volkswagen Vento model, which is a copy of the Polo sedan. The Voltwagen Vento sedan debut took place in 1992. The name of the car translated from the Italian means “wind”. 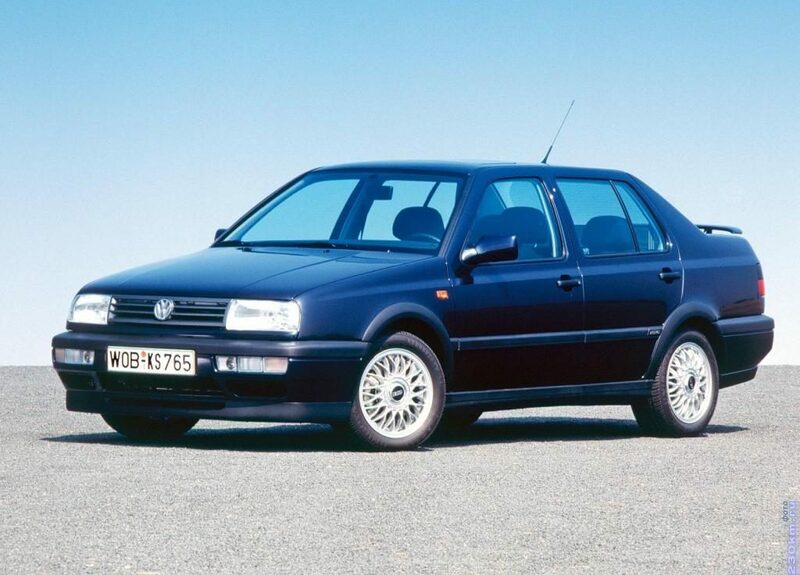 In 1993, Volkswagen Vento began to be marketed in the US market under the name of Volkswagen Jetta III. In 1995, the model was upgraded, changing the appearance and equipment. It was produced by Vento until 1998, until replaced by the new Bora model. Volkswagen Vento was created on the basis of the model Golf III and from a technical point of view practically does not differ from this model. Outside, Vento differed only in small details such as original lighting, grille, bumper and, of course, body shape. However, the Vento was slightly larger at the expense of a separate trunk, the volume of which when not folded rear seats was 550 liters, and with the accumulated 850 liters. Salon Volkswagen Vento is quite spacious for its class. The size of the sedan is 4380 mm in length, 1695 in width and 1425 mm in height. The VR6 engine is of two types. With a front-wheel drive volume of 2.8 liters (174 hp) and four-wheel drive versions Syncro (appeared at the end of 1994) with a 2.9-liter engine power of 190 hp This is a snap of the standard version. Of course, such engines will please the car owner with good dynamics, but for this will have to pay more expensive service and high consumption of gasoline. For example, an engine of 2.8 liters consumes 15 liters per 100 kilometers. Therefore, the most optimal are engines with a capacity of 1.6 l / 75 hp and 1.8 l / 90 hp Since 1996, Vento began to install an engine with a capacity of 1.6 liters and a power of 100 bhp. There are diesel versions of the sedan. The weakest of them was 1.9 l with a capacity of 64 hp. The same engine, but with turbocharging, either 75 or 90 hp Since the summer of 1996, the 1.9-liter turbodiesel of the new design with the capacity of 110 hp has appeared. The Vento suspension is borrowed from the Golf McPherson front with a stabilizer for transverse stability, and behind the so-called semi-independent beam (in the all-wheel drive versions the rear is also independent). In 2011, the Vento model was introduced in India, which qualitatively differed from the pioneers of the ruler. As a result of the redesign, Vento received a new bumper with horizontal, rectangular fog lights. The three-component grille of the radiator has become larger. On the hood appeared more distinct bends. The rear part was marked by refreshed lights that mimic LED lighting. The rear bumper made the Vento wider. The car received a lot of chrome decorative exterior elements, including: door handles, facing front and rear bumpers, and exhaust pipes. In the driver’s salon will meet a color scheme of brown and beige and more modern equipment. The interior has become more refined. The base of top models includes cruise control, the function of cooling the glove compartment, the left foot pedal, the button for the remote opening of the luggage compartment, the complex side mirrors with electric drive and LED indicators. Improved control parameters. Under the hood there are gasoline and diesel power units. Particular attention is paid to the productive gearbox DSG.